I think everyone looks back on a particular time and wonders, Did that really just happen? I've been asking myself exactly that since just before I went to sleep at 1am last Thursday. Wednesday, April 25th was one surreal experience after another. 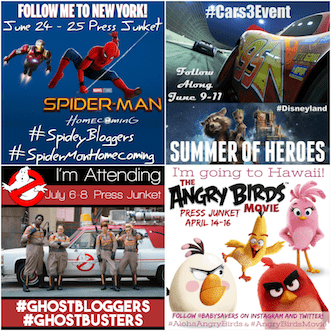 I, a little mom blogger, had arrived in Los Angeles the previous day to meet up with 24 other influential mom bloggers and cover the Iron Man 3 Hollywood premiere. After an amazing day filled with surprises and celebrities, I thought I was prepared to attend the red carpet premiere of Iron Man 3. 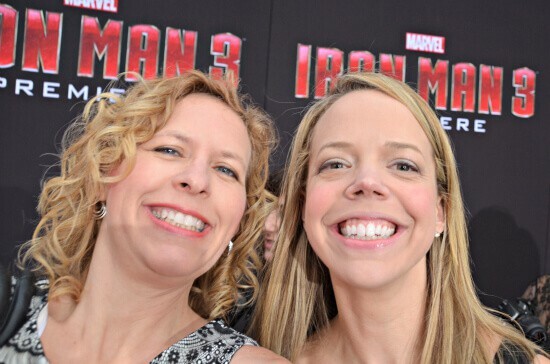 Looking back, nothing could have prepared me for the actual experience of the red carpet premiere for iron Man 3. It was quite possibly one of the most memorable experiences of my life. After getting dressed up and taking advantage of photo ops with friends, we waited on side street around the corner from the theater until our Disney leader got the go-ahead that we were ready to walk. That go-ahead came immediately after the above image flashed alongside us–engine revving, sporting a license plate reading Stark16 and surrounded by LAPD officers on bicycles. It didn't take long to realize that the star of Iron Man 3, Robert Downey Jr. was driving the car to make his own grand entrance onto the red carpet. He was gone in a flash, but the screaming fans right around the corner indicated that he wasn't too far ahead of us. As it turns out, I ended up being behind him for a moment before he stepped onto the red carpet for a moment. Granted, there was a crowd, security guards and barricades between us, but I'm pretty sure That's the closest I'll ever get to Robert Downey Jr.! The star of the movie was quickly whisked away from the crowds and I started my own walk down the red carpet. The red carpet for Iron Man 3 was thrilling in its intensity. All the screaming fans, police offers, security guards, camera, film crews, celebrity reporters and genuine ceremony definitely made for an unforgettable moment. My good friend Chrysa from ThriftyJinxy and I paired up so we could take a few pictures of each other as we made our way to the movie entrance, (she took that photo of us together) but I swear I was so shaky and star-struck I'm lucky I even remembered to take photos on my own! After all the celebrity-spotting (and feeling a bit famous myself!) 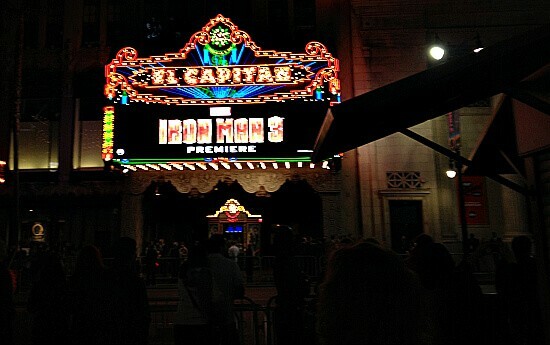 we were ushered into the El Capitan Theater to watch Iron Man 3. I'll have a review of the movie posted a little later this week, but if you're wondering if it's really that good, the answer is YES, it's that good! Thanks, Crystal. You looked SO good, too! 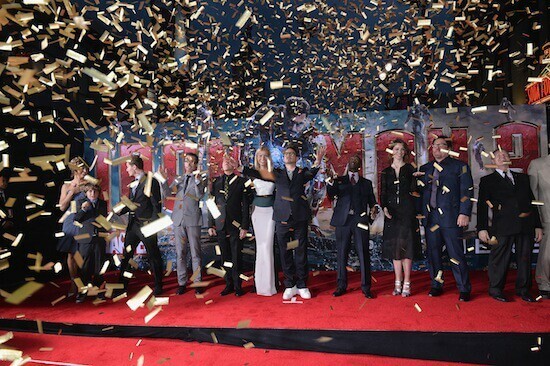 I had so much fun and I can’t imagine a better group of people to experience the Iron Man 3 event with! 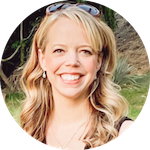 Your smile is contagious! You are so pretty in everything you wear BUT you absolutely looked stunning in your dress! So glad to be able to have met you! I agree, best smile award! Great meeting you, you are beautiful and what a fabulous time we all had! PS. I need to know where you got your cowboy boots, LOVE them! Thanks, Jen! I was so happy to finally meet you. I feel like I’ve been acquainted with you for years, and now I can’t wait to see you again. I hope it’s sometime soon! That night really was amazing! I had such a great time walking the red carpet with you and scoping out celebs in the theater. Can’t wait to see what our next adventure might be! We’ve definitely had GREAT adventures, haven’t we? I feel so lucky! I still get so excited just telling my friends and family about walking the red carpet, what an amazing experience!! Really, I don’t think I’ll ever NOT be excited about it! Such a pleasure meeting you and you looked stunning on the red carpet! Thanks, Sarah! It was so fun to meet you, too! I have been asking that myself too! It was so fun meeting you in LA! I totally agree about being shaky on the red carpet. It was quite the experience.